There's a boy in this Barbie commercial, and he is a sign of the girly-capitalist end times. 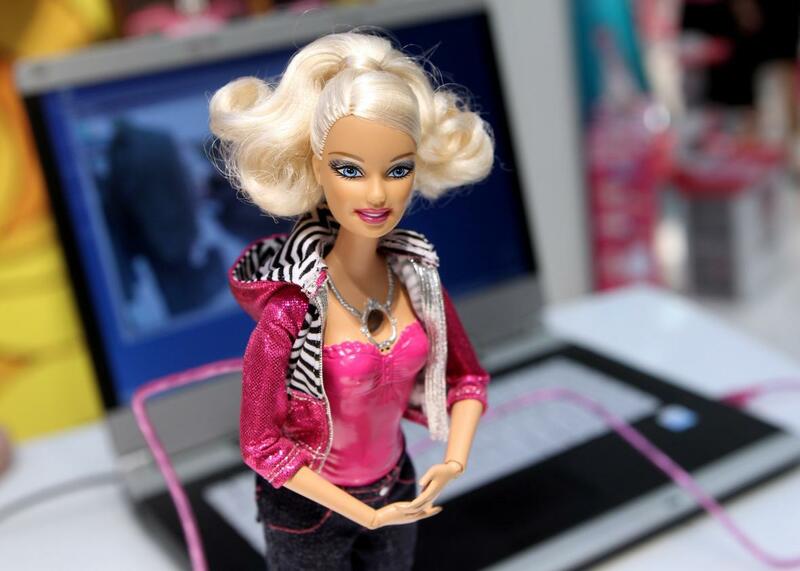 This Barbie, at the 2010 International Toy Fair in Nuremberg, Germany, says buy, buy, buy! Before you watch this commercial for Barbie’s new $150 Moschino-branded doll, I should warn you: There is a boy in it. In the lead-up to this year’s holiday gift-buying hubbub, which is sure to incite yet another round of gender-specific toy fundamentalism, Mattel has come down on the side of dolls for all. Towleroad points out that the adorable little boy, who ends the commercial with a wink that far exceeds the fine motor skills of the rest of his age bracket, is a dead ringer for Jeremy Scott, Moschino’s creative director. Accordingly, the kid is a parody of what you might imagine a 5-year-old who knows the word Moschino would be like. “Moschino Barbie is so fierce!” he declares. So that’s how you pronounce it. The commercial is bound to draw angry rants from right-wingers convinced that our country is becoming a haven for femme supremacy and girly-men because of this kind of doll-based propaganda. (Take a gander at the video’s YouTube comments for a sampling.) For the record, a country of femme supremacy and girly-men sounds like my own personal dreamhouse. But the video is far more offensive for its indoctrination of children into good capitalist behavior. First of all, the children use the word Moschino, the name of a fashion brand, as a standalone descriptor. “She’s the most Moschino Barbie ever!” says the little girl at the start of the commercial. Barbie’s shirt says it’s “The Most Moschino T-Shirt Ever.” The lesson: Corporations are people, and brands are adjectives. Then there’s the Moschino tie-in, a line of adult garments that range from a $225 T-shirt (yes, it’s the most Moschino ever) to a $1,695 purse that matches Barbie’s. It’s a built-in conduit for a Barbie-loving kid to become a debt-ridden adult with a purse habit. So while the right-wing mob cries over the demise of our country’s gender-segregated doll history and everyone else celebrates Mattel’s admission that boys like dolls, too, I’ll remind the kids in my life about the basic underpinnings of the free market. It stands to reason that Mattel—a company that makes its money selling dolls—wants more kids to want dolls. More parents buying dolls means more money for Mattel. Bah humbug.